FRAMINGHAM, Mass.--(BUSINESS WIRE)--Nov. 13, 2013-- Staples Advantage®, the business-to-business division of Staples, Inc., today announced a new mobile app that lets clients order anything their business needs from their office or on the road, whether it’s coffee and pens, PCs and printers, or breakroom furniture and cleaning supplies. 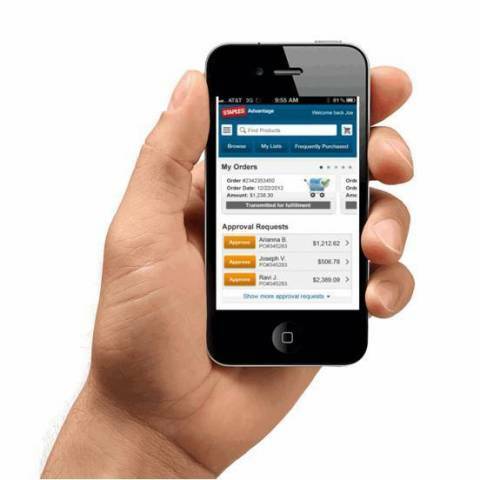 To create a seamless ordering experience, Staples Advantage app users log in with the same credentials used on the desktop ordering site to access all essential account information in one place. The app syncs everything from the desktop site, including orders awaiting approval to items ready for purchase in the shopping cart to a user’s purchase history.